Obituary – Gray, Lenora Ann (Neal) « Perry High School Alumni Association, Inc.
Basketball Team 15-16; Tannhauser Club; Laffin’ Club. Lenora has been with us just a year. Lenora Neal was born at Douglas, Kansas, March 18, 1896. In 1912 she came with her parents to Oklahoma, coming to Perry in 1914. 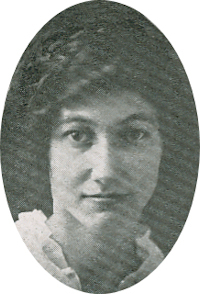 She graduated from Perry High school with the class of 1916. She was active in all the students enterprises, being a member of the basketball team. Upon the completion of her high school work she was employed in the local telephone office where she gave courteous and efficient service. Later she took a business course at the Chillicothe Business College, Chillicothe Missouri. Completing her business course she was employed by the Comar Oil company, Tulsa, Oklahoma. November 17, 1923 she was united in marriage to John F. Gray of Tulsa. To this happy union was born one child, Barbara Jean, January 19, 1924. After a long, trying illness which she bore with superb courage and commendable fortitude she died January 29, 1927 with sublime faith and peace into the City which by the eye of faith she had seen afar off. Lenora, as she was always known to her friends, lived a life of sweetness and graciousness. Friends were attracted to her by the lovliness of her soul. With a noble mothers heart she loved, Barbara Jean, though denied by the nature of her affliction many of those little contacts with her which her heart craved. Thinking of others, both in health and in sickness, she gave expression to a character of the finest type. A smile an cheery words greeted every one who visited her in her long illness were helped quite as much as she because of her patience, cheerfulness and fortitude. She is survived by her husband, F. Gray, little daughter, Barbara Jean, her parents, Mr. and Mrs. L. F. Neal; two brothers, Roy of Perry and Ray of Tulsa; one sister, Mrs. Clara Ricker of Beaumont, Texas.